The runtime performance of NFsim scales with the number of biochemical rules in a model, not with the total number of reactions or molecular configurations. Therefore, NFsim can often simulate complex biochemical models faster than the Gillespie algorithm (SSA) of even ordinary differential equations (ODEs). 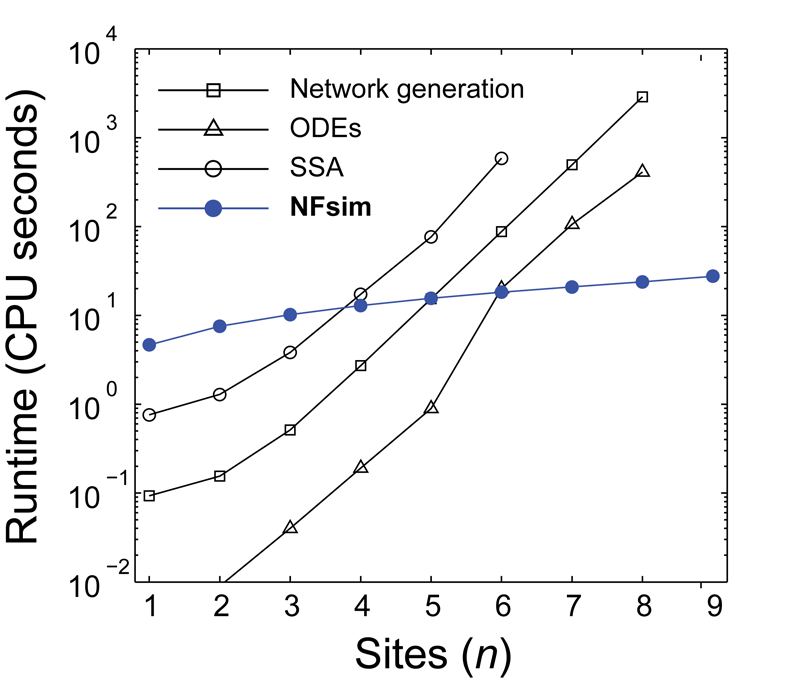 As the detail of a dynamic model is increased (shown in the graph to the left by increasing the number of phosphorylation sites of a protein), NFsim performance exceeds both ODEs and the SSA. 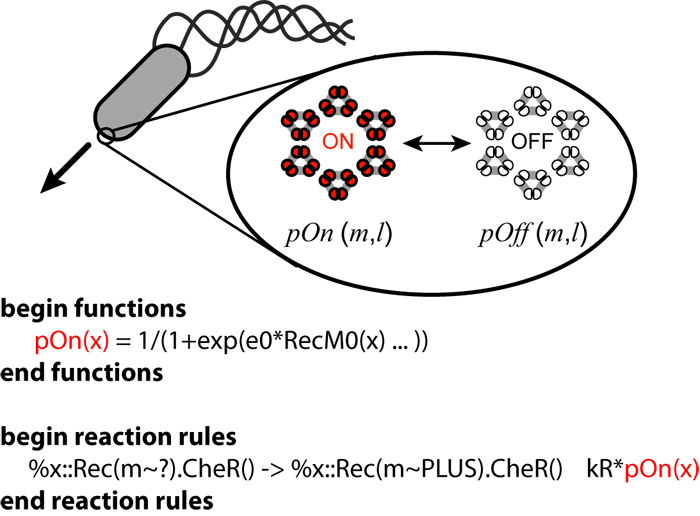 It is often necessary to include approximations or simplifications in a model due to a lack of information or because it is too costly to simulate all of the molecular details. NFsim supports the definition of reaction rates as arbitrary mathematical or conditional expressions defined in terms of the state of the system or of individual molecules, allowing you to easily incorporate complex biochemical approximations such as cooperativity. 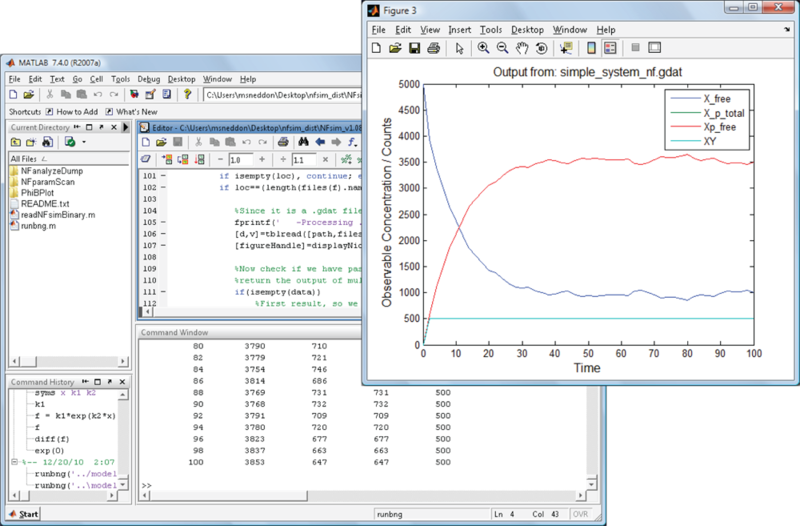 NFsim includes a documented set of Matlab-based scripts and functions to help in analyzing models, visualizing results, and extracting data from simulations. With these tools, you can automatically vary parameters to help with sensitivity analysis, extract the molecular connectivity of large aggregates or polymers, or use these functions to track single molecules in your system. NFsim is integrated with BioNetGen so that many of the models written for NFsim can be immediately simulated with ODEs or the SSA by just adding a single line to your model file. With this capability, you'll be able to immediately tell which method can simulate your system the fastest and, when possible, compare stochastic and deterministic results. For some models that have limited numbers of reactions or states, you can even use BioNetGen to export your model to SBML. The goal is to allow you to write a single model, then choose how exactly how you want to simulate it.